I go purple all of the time, purple has been my favorite color since I was a little girl and I guess you can say that now for the month of June I bleed purple. I’m sure my fraternity brothers of Omega Psi Phi are going wait a minute?, (That’s one of their colors), but for Alzheimer’s I live it. June is Alzheimer’s and Brain Awareness Month. One of three months (the others are Sept. – World Alzheimer’s Month and Nov. – National Alzheimer’s Disease Awareness Month) designated to further highlight this growing disease. Over five million Americans are living with this disease and that number is expected to jump to 75 million by 2050 and over 47 million people are living with dementia Worldwide. It’s the 6th leading cause of death and the only one without a cure. In the United States someone develops Alzheimer’s every 66 seconds. In 2017, Alzheimer’s will cost the United States $259 billion. This number is expected to rise to over $1 trillion by 2050. 15.9 million family and friends provide care to people with Alzheimer’s and other dementias in the United States. The annual global cost of dementia is $818 billion in U.S. dollars. Sadly, this illness is becoming a growing silent epidemic. Silent because it scares people to talk about a disease that can take your mind, have you forget almost everyone and everything that you know, decrease your ability for self-care and one that currently has no cure. But those of us who advocate for the afflicted and their caregivers, as I once was, are fighting every day to remove the stigma, to provide hope and compassion and work every day to end alz. So what will you do? 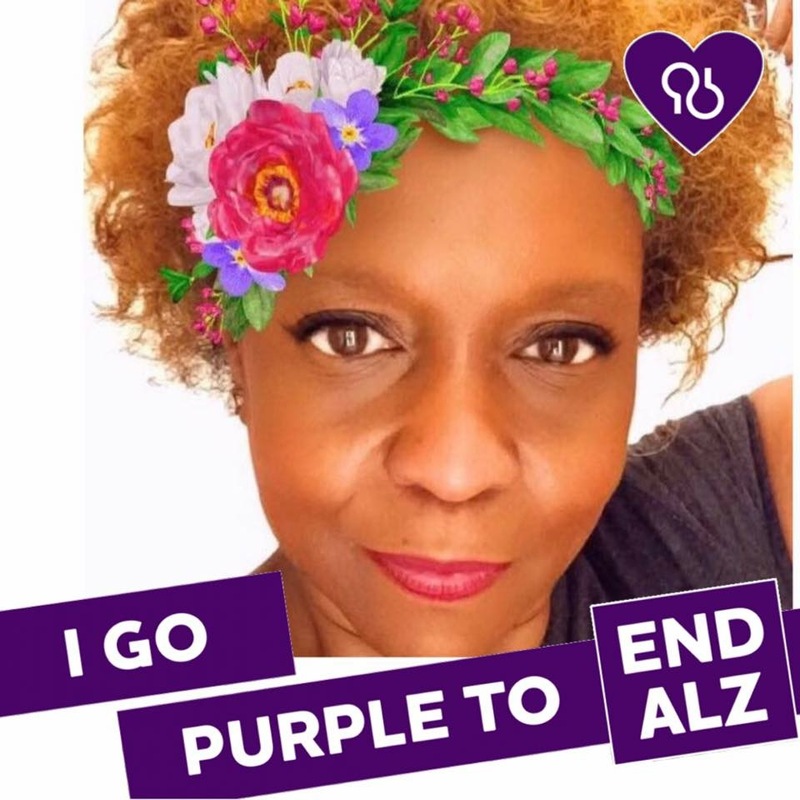 Will you add the “I Go Purple” frame to your Facebook profile picture? Will you send one tweet, or share one Facebook or Instagram post that you stand with those who are fighting against Alzheimer’s? Will you participate in an activity tomorrow June 21st, that benefit’s the Alzheimer’s Association’s The Longest Day? Will you wear purple? Your life doesn’t have to be affected directly to advocate, but I’m sure you know someone whose life has. Stand for and with them. Tomorrow, June 21st, the summer solstice, join in on one of the Alzheimer’s Association’s largest fundraisers, The Longest Day. The Longest Day is a day about love. Select any activity you love — or an activity loved by those affected — and team up with the Alzheimer’s Association to raise funds and awareness for care and support while advancing research toward the first survivor of Alzheimer’s. All across the US there will be activities beginning tomorrow into the weekend. Lead, join or support a myriad of activities, from dancing, bowling, BBQs, and baking to card games, dinners, running and biking all in an effort to raise funds and awareness. If you would like to participate in a local activity or start one of your own click here. To learn more about Alzheimer’s, caregiving, the Longest Day and/or fundraising, please feel free to contact me at mizzriv@gmail.com or visit the Alzheimer’s Association’s page. If you’re posting support use these hashtags #ENDALZ #aworldwithoutalz #thelongestday. And don’t forget to wear purple. What happens when co-workers discover that they their lives are being touched by the same pain and changes at the same time? They do what most people would do, come together, brainstorm and decide to birth a company, right? Liz Gindraux, Susan Evans and Carol Palmer’s lives have all been affected by Alzheimer’s. Liz’s mother and Susan’s dad both have Alzheimer’s and Carol has her personal connection to the disease through a family friend, and together they created Rivet Revolution in the summer of 2016. Inspired by the strong and permanent bond of the rivet, Rivet Revolution was formed with three goals in mind; support for caregivers, to fund research, and to empower the networks of families and friends who have been affected by Alzheimer’s and to have a blast in doing so. 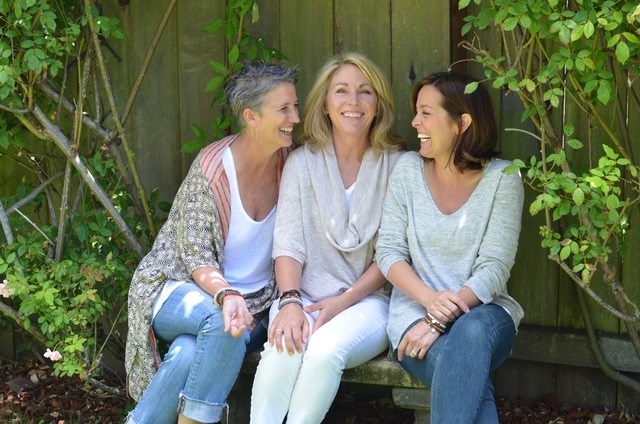 The San Francisco Bay based trio then posed these questions to themselves; what would be a great way to bring people together, to get them talking about this disease and how to turn that negative situation into something more positive? 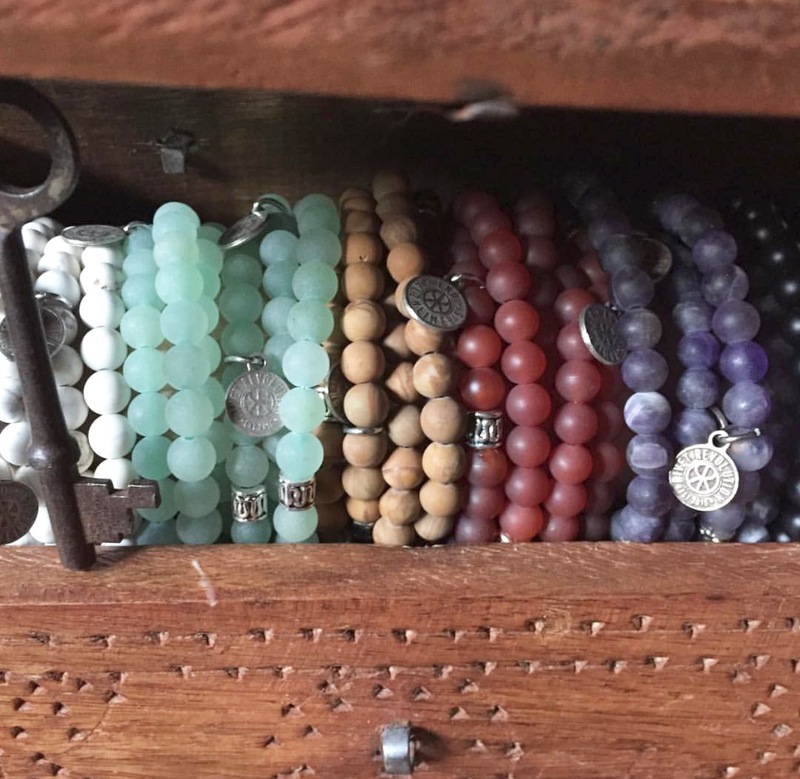 With Carol handling design, Susan outreach and Liz marketing, that something positive came in the form of creating meaningful, stylish, hand-crafted, and affordable bracelets. 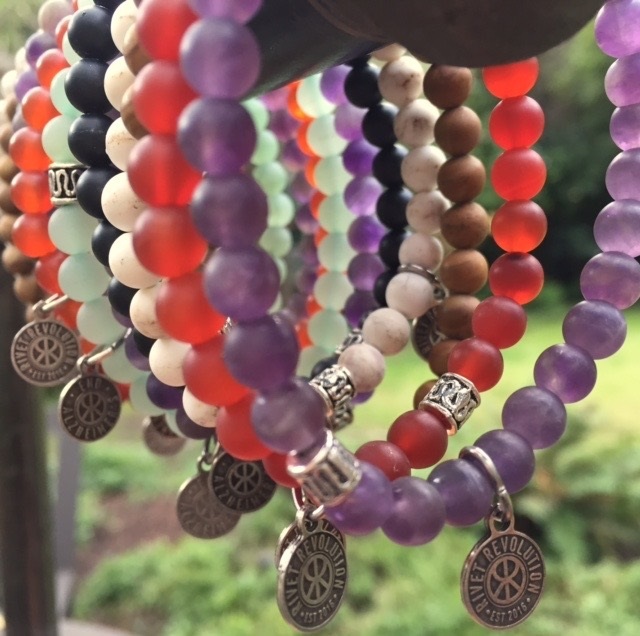 Rivet Revolution’s beaded bracelets come in an array of beautiful colors and are designed with a purpose, to arouse conversation, raise awareness, help take away the stigma of this disease and form connections amongst those impacted by Alzheimer’s. Taking their passion a step further, $10 from every sale supports the fight to end Alzheimer’s through partner charities, Hilarity for Charity and Part the Cloud. These donations help to provide funding in Alzheimer’s research and support for caregivers. And for a limited time, you can help share in the revolution through their Spread the Love campaign. If you buy 3 bracelets, they will give you a 4th to give to a loved one. 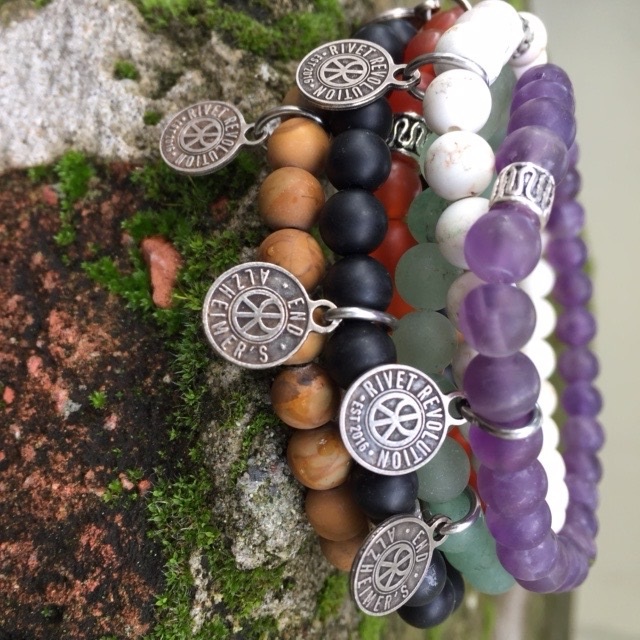 To join the revolution, learn more about their mission and to see their array of their beautiful and inspirational bracelets, visit their website, Rivet Revolution. And stay tuned for upcoming news on what Confessions and Rivet will be doing together. The Revolutioners (l -r) Liz Gindraux, Susan Evans and Carol Palmer.